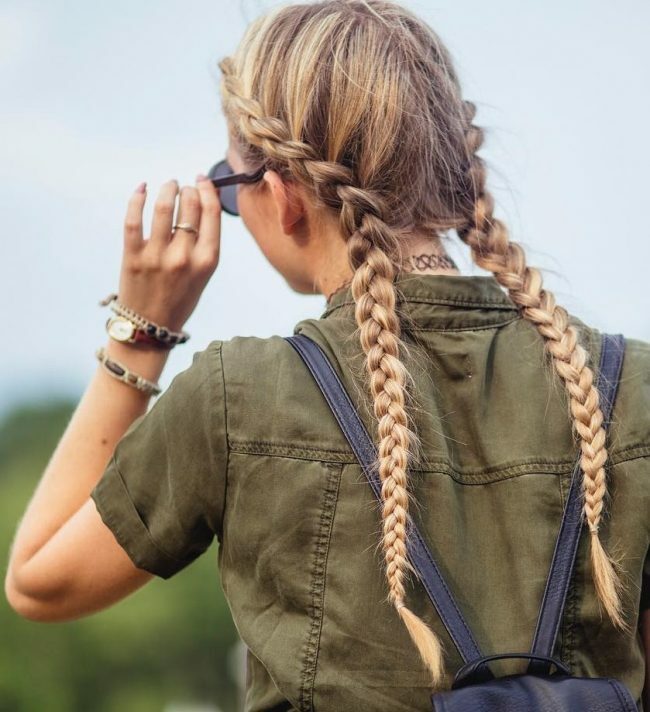 Pigtail braids offer ladies a straightforward but stylish way of weaving their hair. They only take a couple of minutes to make, but they look gorgeous. 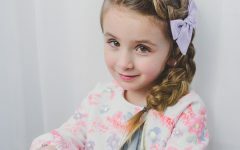 To create pigtails you only need to section your strands into two and then weave each into a Dutch, French or fishtail twist that flows to the back and finish by tying each with some bands a few inches from the end. The design mostly entails having two pigtails, but some ladies will have three hanging at the back. 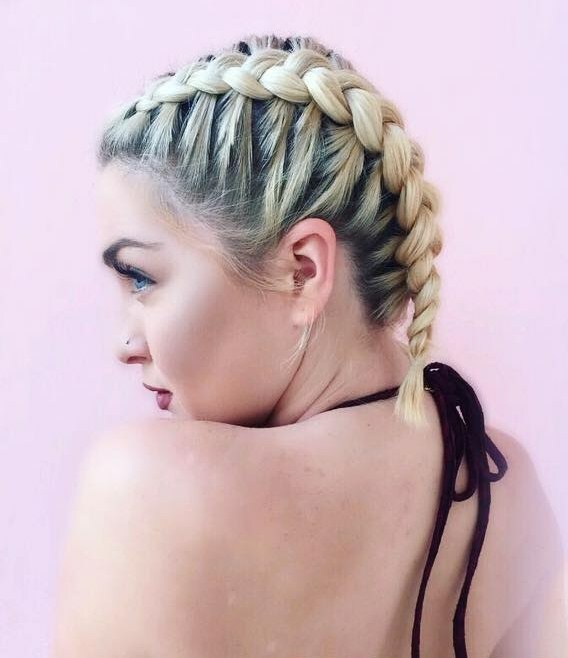 This hairstyle is very simple, and so it is perfect when you do not have time to create complicated braid designs. 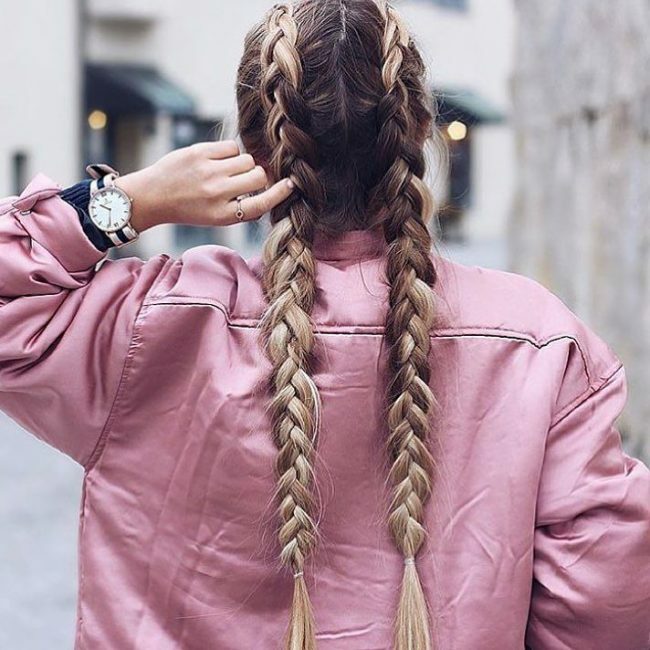 It entails sectioning your strands into two and then weaving each part into a long and neat Dutch braid that should go all the way to the back and finish by tying each with elastic bands. If you have a beautiful natural hair like this one with a dazzling dark tone, then some pigtails are enough to make you look stylish. To create them you only need to form a center part and then weave a neat braid on each side that flows to the back diagonally. You should then finish the design by sweeping them to the front over the shoulders. Playing around with your hair is the only way to get a unique hairdo like this one. Here the long strands have a beautiful natural blonde shade. And to give them this lovely design you should weave two twists that crisscross at the center of the head and flow all the way to the back to form some cute tails. This design is very effortless, but it will still make a woman look beautiful. To replicate it you only need to weave two loose and messy twists on the side and leave them hanging at the back of the head to form some extra cute pigtails. The natural redhead in this design is one of the things that make this a top notch headdress. The strands have a very simple styling that entails forming a center part and weaving two neat medium size twists that flow all the way to the back. 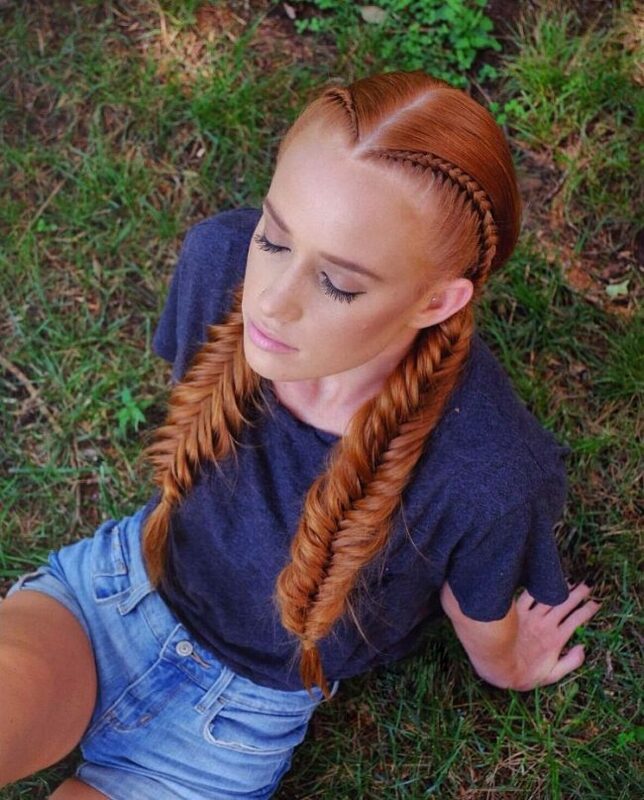 Here is another gorgeous redhead but with some very inventive braids. 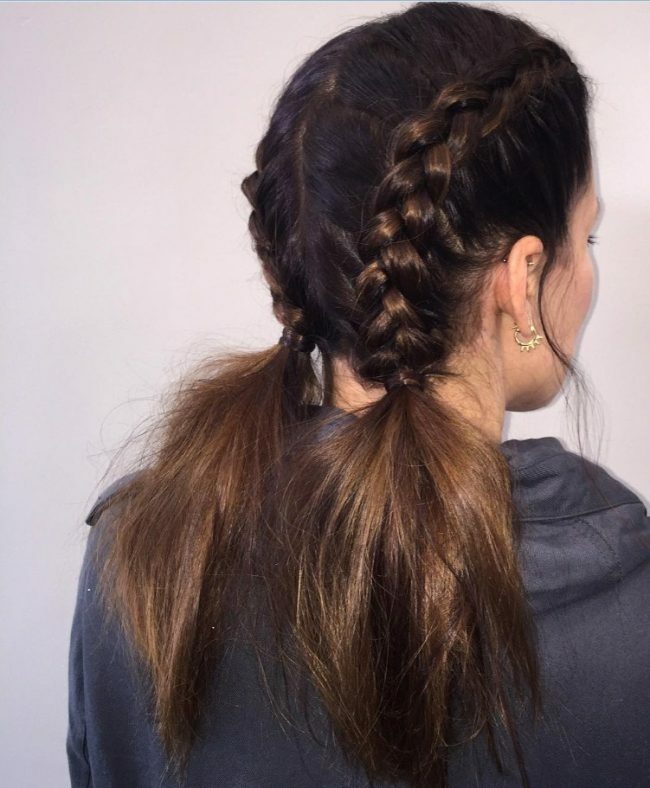 The style begins with two small Dutch twists that start at the center part and flow to the sides. 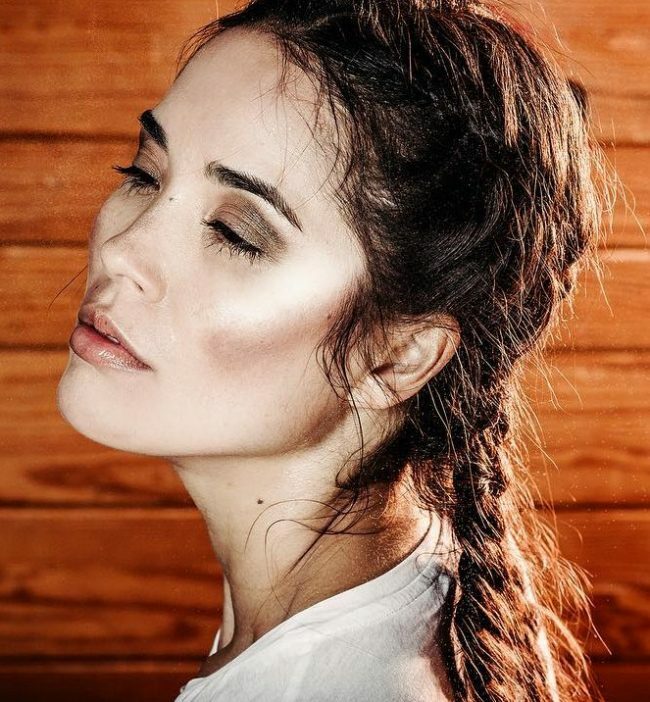 However, the two twists transition into a medium fishtails just below the ear that incorporates all the strands, and you should style by sweeping them over the shoulders. Unlike most other designs, the twists in this style do not start at the front. 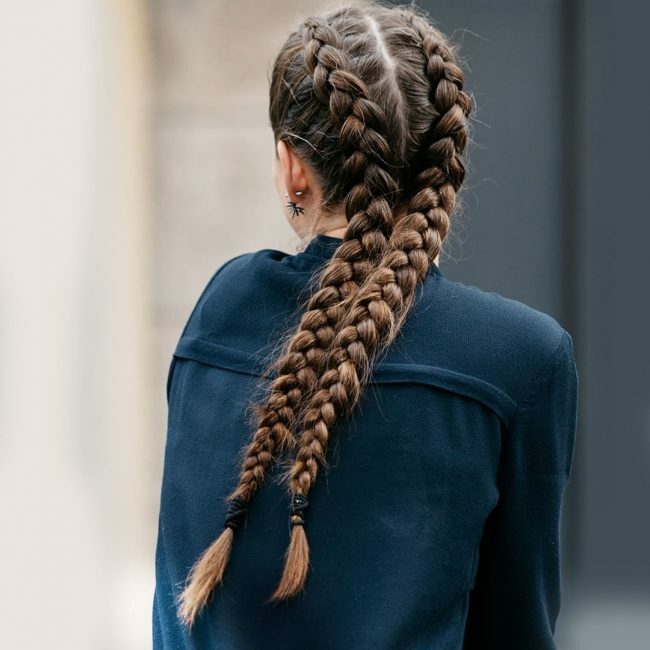 Instead of weaving the hair all the way from the top you should gather them into two pony-like locks and then weave each into a neat braid that starts at the back of the head. A little innovation is all that you need to make your hairdo unique. 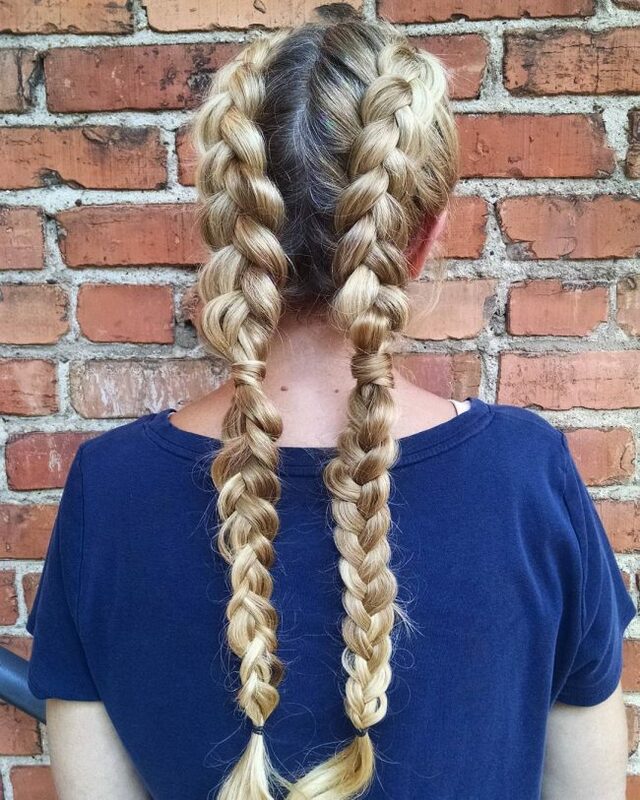 The golden blonde locks in this design have a beautiful shade and two cute Dutch twists. However, the two twists also have a pony knot at the back, and this is what makes them look unique. The slight dazzle in this long and thick brown locks make them look extra charming. But, their braiding style is what makes this an outstanding style and it entails weaving two French twists that start from a center part. The two twists flow all the way to the back where you should design them to hang over the shoulders. You do not require perfect knitting skills to create this headdress because it is very easy. All that you need to do is to give your locks a center part and then weave each section into a loose fishtail that you should finish by flipping and tie the ends with an elastic band. The hand painted blonde shade in this long mane gives the design an excellent tone. Apart from this, the strands also have some simple pigtails that you can form with a center part and with the two tails flowing straight to the back. 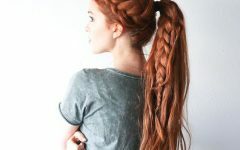 Using two types of braid in the same hairstyle is very trendy, and this is what makes this hairdo look extra charming. The hairdo entails starting two Dutch twists at the front of the head and then transitioning them into fishtails at the back of the head. These strands also have a cute ombre color pattern that helps to bring out the distinction between the two types of twists. 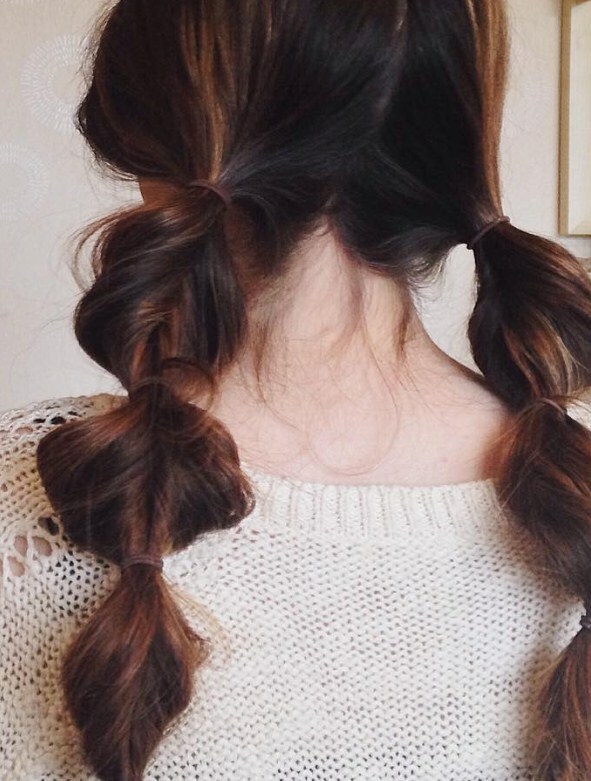 Pigtail braids also work for short or medium hair, and you just need to know how to form them. And if you also have a dazzling hair tone like in this hairdo then you can be confident of a refined look. 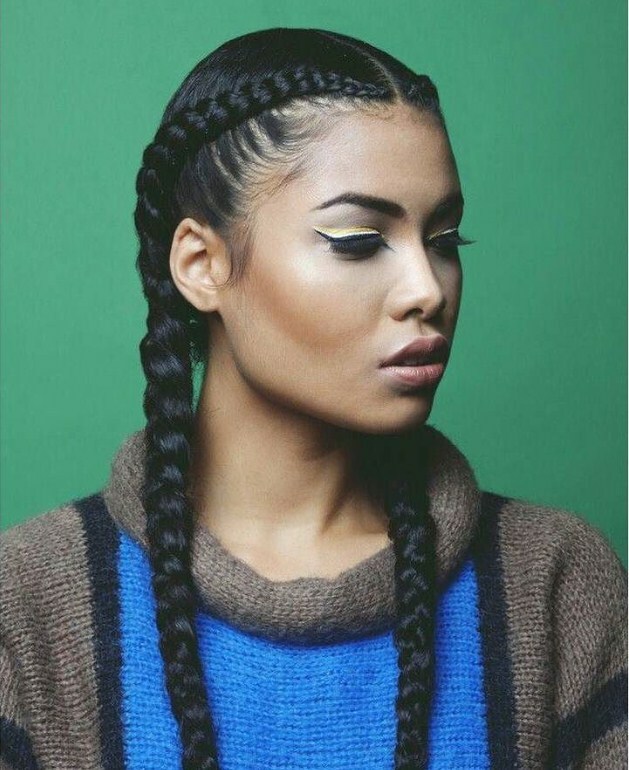 To create this style you only need to weave your strands into two Dutch twists and then finish by flipping them at the back for an inverted look. There is nothing complicated about this hairdo but it will still make you look fashionable. It entails weaving your fine locks into two straight and medium size Dutch twists that flow to the back and hang over your shoulders. Instead of gathering your stands into one braided ponytail you can section them into two and weave them into some breathtaking pigtails. You should knit them on the sides and make sure that they are neat as this is what will give you the extra chic look. 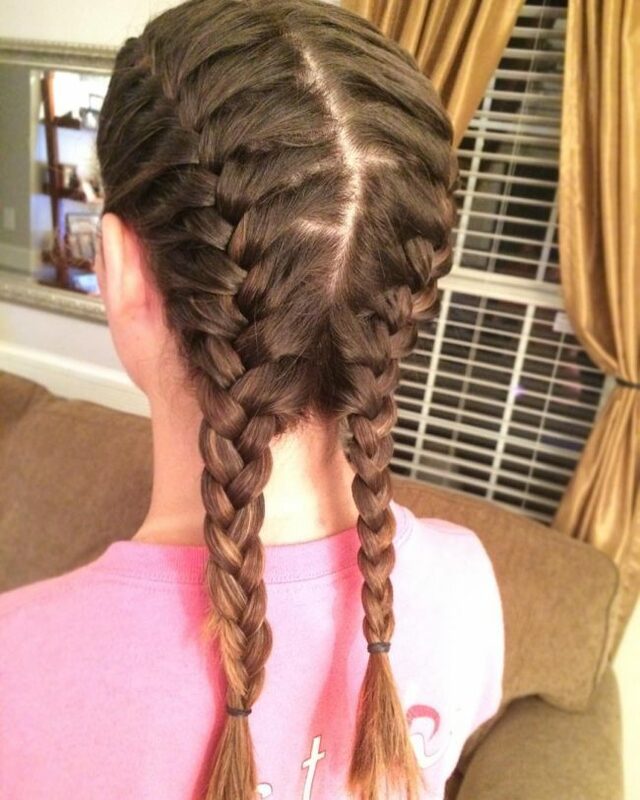 This fancy hairdo starts with some neat French braids on the crown, and they flow all the way to the back. 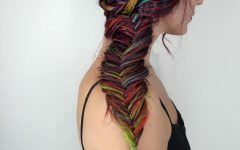 However, you should change the knitting style into a rope twist a few inches to the end to create some unique pigtail braids. 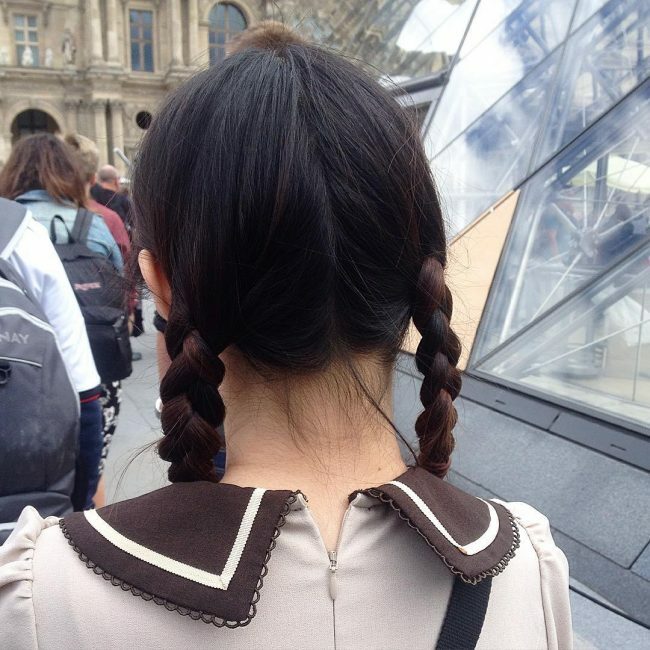 Pigtails do not always have to flow to the back because there are still many other ways of making them. 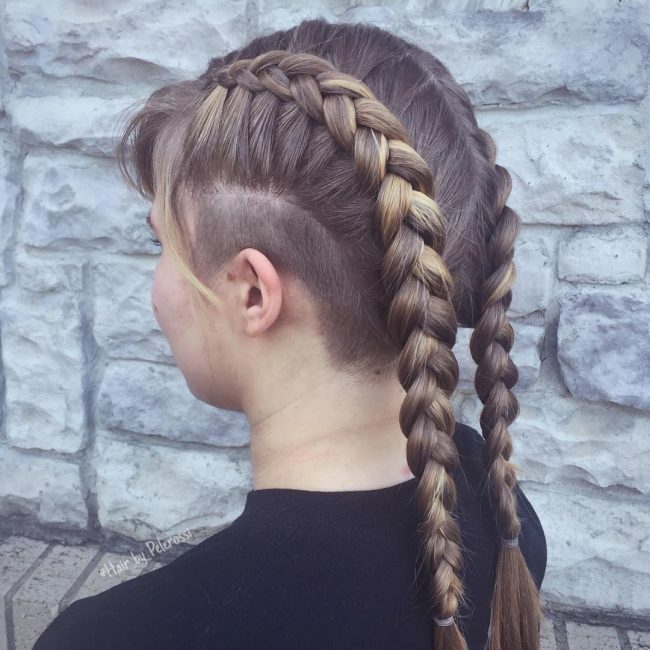 This style demonstrates one of the alternatives, and it entails sectioning your strand into two parts and then gathering each on the side of the head. You should then tie them into a tight ponytail and then weave the strands protruding from each pony into a rope twist. 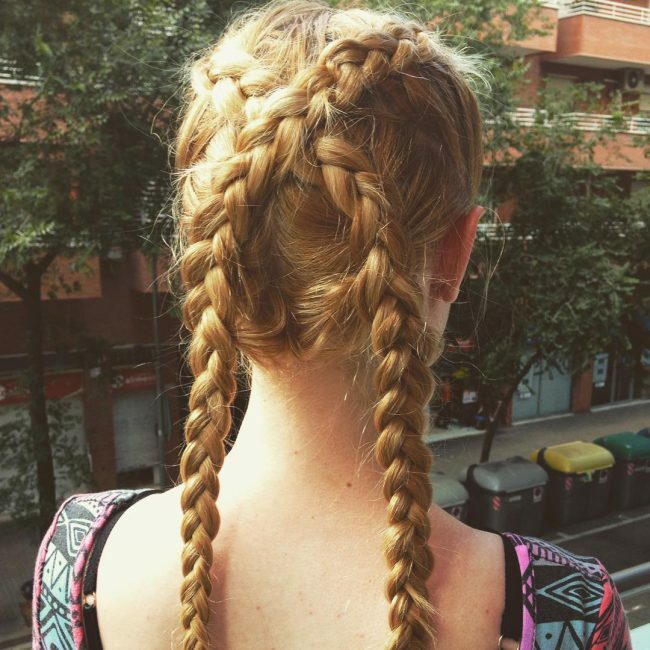 Braids are not only very protective but also cute and easy to make, and this is more so if they are simple double braids like these. Here you only need to weave the locks into two straight French twists flowing to the back to form some fabulous pigtail braids. You can always spice up your tails with some bangs instead of just having them in the traditional style. 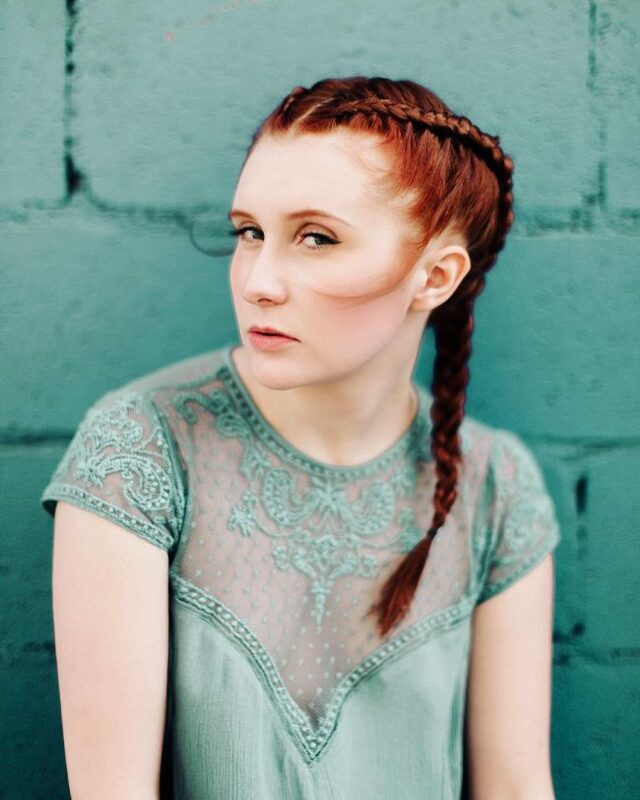 This hairstyle demonstrates how you can do this, and it entails weaving two neat Dutch twists that form the pigtails. However, you should also leave some free locks at the front and use them to create an arched fringe that will make your hairdo look distinct. This headdress is another example of the beautiful braids that you can form with your medium size hair. To create this style, you will first need to freehand paint your strands with a golden blonde shade. The next step is to weave them into two medium size French twists that flow to the back to form the pigtails. The platinum blonde shade of these strands is breathtaking, and it makes it easy to work with the medium size hair because you can almost not go wrong with any style. And to give them this adorable appearance you should weave them into some simple Dutch braids and finish by tying with bands in the ends. Dimensional brunette and brown strands like these should have a cute style as they will make you look magnificent. You also don’t have to do much because knitting your textured strands into double Dutch twist with some open ends is enough to give you a stunning headdress. Some cute and neat rows like these will always assure you of a modern and refined look. 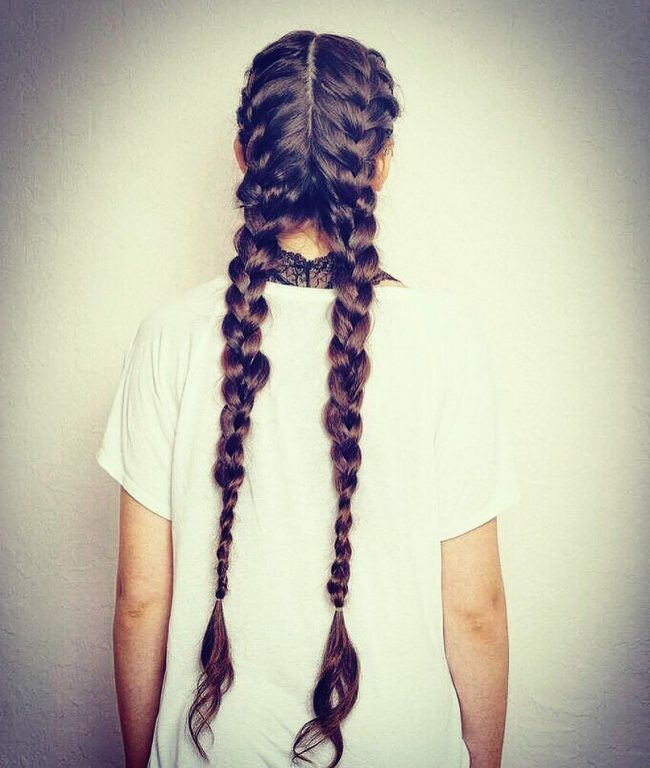 To create them you only need to weave four neat rows of braids that start at the front and flow to the back. However, you should join them at the back to form some neat pigtails. The only other thing that you have to do is to sweep the tails to the front over the shoulders. You have to think outside the box if you want a style that will make you look unique. 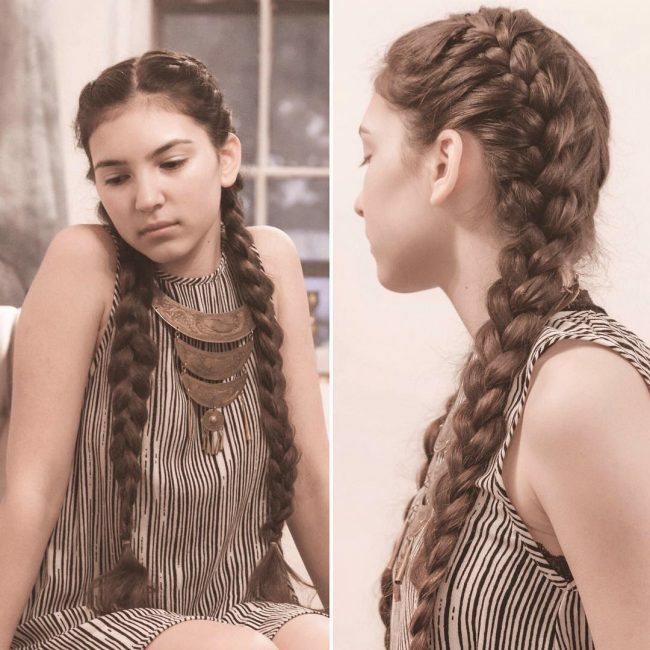 This design shows one way to do this, and it entails weaving your strands into three boxer braids that flow to the back to form some distinct pigtails. The tails have some cute cloth bands on the ends that also add to the beauty. These pigtails are unique because you do not have to spin your strands to form them. 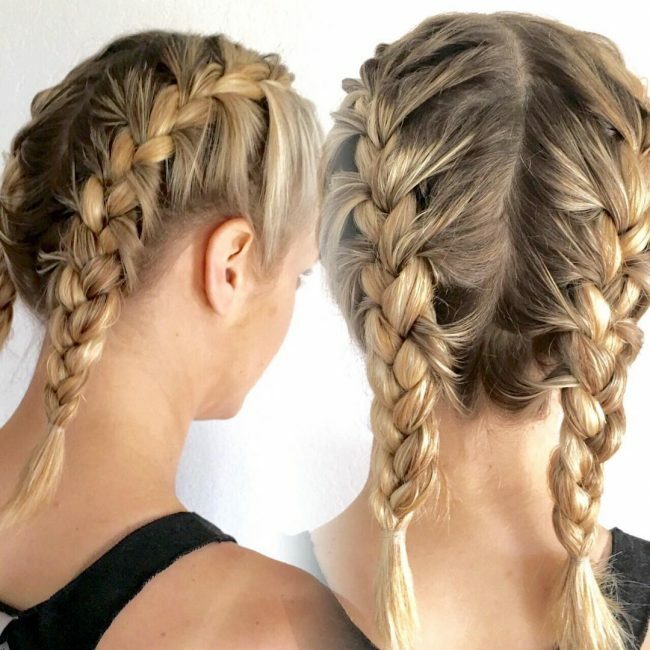 Instead of using the traditional braiding techniques you should brush back your strands, divide them into two and use some bands to tie them in different places to form bubble braids. 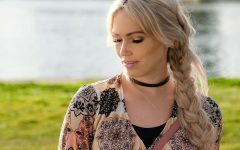 Pigtail braids are cute and very easy to create, and so they are a perfect idea for your on-the-go style when you do not have a lot of time to spare for your hair. They are also a protective style that will work for most ladies, and you can also keep them for a couple of days. And with the 25 beautiful styles above in mind, you will never run out of ideas on how to make them.